ASI is standardized Europe-wide in EN 50295 and internationally in IEC 62026-2.Network system for the lowest field level (binary sensors and actuators). Data and energy are transmitted between control unit and peripherals via an unscreened, geometrically coded two-core flat cable (pole safe). The conductor is contacted by piercing technology within the ASI-modules. 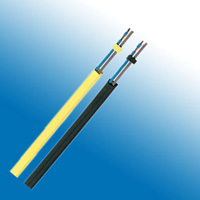 The special outer jacket provides protection against bio-oil, grease, and refrigerant lubricants, and the cable is therefore even suitable for applications in wet surroundings, in machinery and plant construction, as well as in the machine tool and automotive industry.